A123 batteries may be a perfect alternative if you don't feel comfortable charging a typical lipo pack.However, there are some things to consider before making the change. First things first. What the heck is an A123 battery? With the help of MIT, a company called A123 Systems developed the M1 LiPo4 Battery Technology with the ultimate goal of using these batteries in electric powered vehicles. A123 cells have since become proven technology being used in everything from cell phones to large Dewalt Power tools. Some even refer to this technology as the "M1 Super Cell". A123 Systems recently accomplished their ultimate goal by signing an agreement to supply the batteries for Navastar's eStar Class 2c-3 All-Electric Truck. 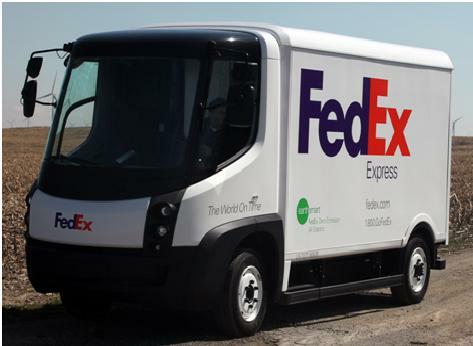 Maybe you will get the chance to see this new truck in action the next time the Fed-ex man rolls up your driveway with that new RC airplane you've ordered? A123 Systems also supply batteries for other vehicles such as the Chevy Volt. Looks like these batteries are definitely here to stay as it seems most of the major auto manufacturers are planning to use this technology in future electric and hybrid cars. Even NASA has jumped on the bandwagon! NASA is very impressed with the performance and safety of A123 Systems LiFePO4 battery technology. In fact, NASA is evaluating A123 battery technology for future Aerospace Missions. As you probably know, LiPo battery packs are very high energy-dense batteries that have literally transformed our hobby by allowing electric powered RC airplanes to be just as powerful as their gas or glow powered counterparts. Everyone knows (or should know!) that one of the main drawbacks of LiPo packs is the fact that they catch fire very easily if not cared for properly. They also take forever to charge while you must sit and baby-sit them.They are fairly unstable oftentimes bursting into flames during crashes. And lastly, the material they're made from is very expensive. So what makes LiFePO4 battery packs different from Lipo packs? Conventional Lipo Packs have Lithium Cobalt Oxide (LiCoO2) cathodes. A123 Batteries use Lithium Iron Phosphate (LiFePO4) as the cathode. 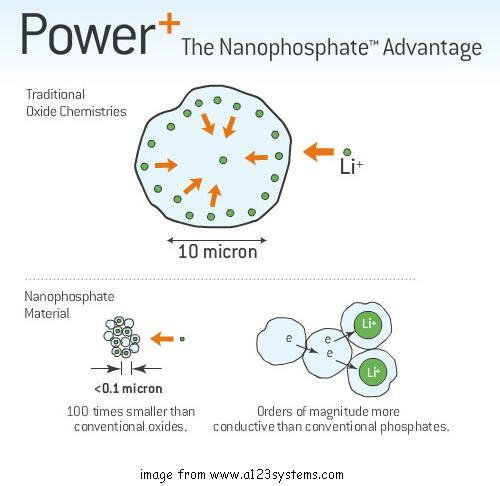 With A123 Systems' patented "nanophosphate" technology, the particles of lithium that loose/gain electrons during charging and discharging are extremely tiny. This makes it possible for the cells to be charged and discharged at very high rates without overheating or exploding like is common with LiPo packs. This technology also allows for the cells to be charged and discharged many more times than LiPo's without loosing capacity. LiFePO4 batteries are considered a "Lithium-ion" battery because they use a liquid electrolyte solution as opposed to the solid "gel-type" polymer used in "Li-poly or "Lipo" packs. This is why most A123 cells are cylindrical. The chemistry of LiFePO4 battery packs is much more stable than the LiCoO2 chemistry found in conventional LiPo's making them much less likely to overheat or catch fire when overcharged or crashed. This is a big plus in my book! Another great advantage of A123 battery packs is the fact that the voltage remains virtually constant throughout the entire discharge curve which allows you to fly at full power the entire flight. 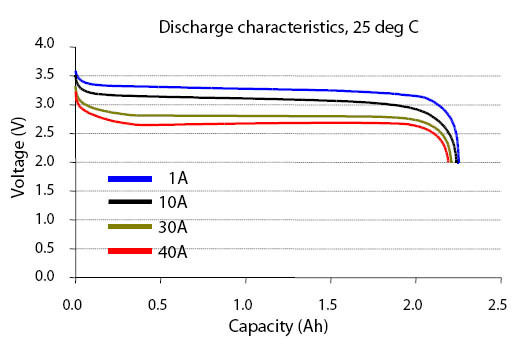 If you are accustomed to using LiPo packs, this flat discharge curve of These batteries can take some getting used. If you're not careful you'll find yourself going from full power to low voltage cut-off dead stick landing in the blink of an eye with LiFePO4 battery packs! Measuring the voltage of LiFePO4 battery packs is really no indication of how much capacity is left in the battery. So it takes a few flights to get a good idea of how long the battery will last with your set up and flying style. So far so good right? So why isn't everyone using A123 packs instead of Lipos? The big trade off is the fact that LiFePO4 battery packs are heavier and larger than Lipo packs of the same capacity. This means shorter flight times or heavier batteries. This is why A123's are generally used more with RC trucks and cars than with airplanes. The nominal voltage of an A123 cells are 3.3 volts per cell, as apposed to the 3.7 volts per cell of a standard Lipo Pack. The maximum charge of an A123 pack is 3.6 volts where as the maximum charge of a Lipo cell is 4.2 volts. This means that if you try to charge an A123 battery pack with a charger only designed to charge LiPo packs you will over charge the cells and ruin the batteries. Thunder Power TP610C is one of the more popular A123 chargers on the market. It can handle 1-6 Cell LiPo and A123 batteries, 14 NiCd/MH cells and 6-12V Pb batteries. 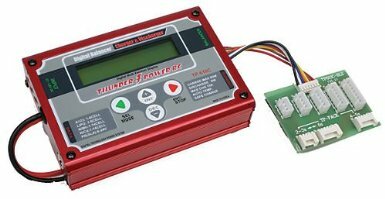 This charger can balance, discharge and cycle batteries and reports back all of the data. It is capable of up to 10 amps (80 watts total) for charging. While Thunder Power is a well-respected name, there are also many other brands of A123 chargers that work just as well. Just remember to make sure that the charger you choose specifies that it will charge A123 or LiFe packs. Where to Get A123 Packs? If you've been around this hobby long, you've probably noticed that the type of folks that fly RC airplanes are generally the curious type that just love to experiment with new technology. It didn't take long before someone tore apart a Dewalt battery pack to see how these new A123 cells performed in the sky! Nowadays you can buy indivdual A123 cells and build your own pack. This thread from RCU Groups will give you an idea of how to build your own A123 pack with balancing leads. If soldering isn't really your forte, you'll be happy to know that you can now buy A123 batteries on Ebay with balancing leads and everything already taken care of for you.